The city is counting down to Halloween and Evil Dead: The Musical is running all weekend. Bela Fleck and Abigail Washburn have mastered the deceptively intricate art of the duet, utilizing just two banjos and one voice. Fall Out Boy has risen from the ashes like a phoenix. They’re taking over Scottrade Center Saturday night on The M A N I A Tour with openers Blackbear and Jaden Smith. 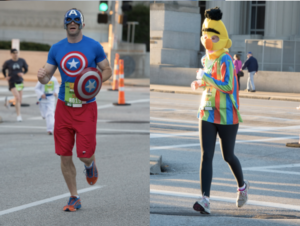 If you’ve ever wanted to run a half marathon while wearing a costume, now’s your chance. Be sure to download the Olio City personalized city guide app (iOS/Android) to always be in-the-know on where to go and where to eat.